Most Holy, Immaculate Virgin and my Mother Mary! To thee who art the Mother of my Lord, the Queen of the world, the Advocate, the Hope, and the Refuge of sinners, I have recourse today, I who am the most miserable of all. I render thee my most humble homage, O great Queen, and I thank thee for all the graces thou hast conferred on me until now, especially for having delivered me from Hell, which I have so often deserved. I love thee, O most amiable Lady; and for the love which I bear thee, I promise to serve thee always and to do all in my power to make others love thee also. I place in thee all my hopes; I confide my salvation to thy care. Accept me for thy servant and receive me under thy mantle, O Mother of Mercy. And since thou art so powerful with God, deliver me from all temptations; or rather, obtain for me the strength to triumph over them until death. Of thee I ask a perfect love for Jesus Christ. Through thee I hope to die a good death. O my Mother, by the love which thou bearest to God, I beseech thee to help me at all times, but especially at the last moment of my life. Leave me not, I beseech thee, until thou seest me safe in Heaven, blessing thee and singing thy mercies for all eternity. Amen. Thus, I hope. Thus, may it be. Most Holy Virgin Mary, Mother of God, I am not worthy to be thy servant. But moved by thy marvelous compassion and my own desire to serve thee, here and now, in the presence of my guardian angel and the whole court of Heaven, I choose thee as my Lady, Advocate, and Mother. I firmly purpose to love and serve thee always, and to do all I can to inspire others to love and serve thee. O Mother of God and my own most compassionate Mother, I beseech thee, by the Blood which thy Son shed for me, to receive me into the number of thy servants as thy child and servant forever. Assist me in all my thoughts, words, and actions in every moment of my life, so that every step I take, every breath I draw, may be directed to the greater glory of my God. Through your powerful intercession, may I never again offend my beloved Jesus. Help me to love and glorify Him in this life. Help me to love thee also, dear and beloved Mother, and to go on loving thee forever in the happiness of Heaven. My Mother Mary, I commend my soul to thee now, and especially at the moment of death. Amen. Most Blessed Virgin Mary, Immaculate Queen and Mother, the refuge and consolation of all troubled souls! I kneel here before thee with my family and choose thee for my Lady, Mother, and Advocate with God. I dedicate myself and all who belong to me to thy service forever. I beg thee, O Mother of God, to receive us into the company of thy servants. Take us under thy protection. Help us in life and at the hour of our death. 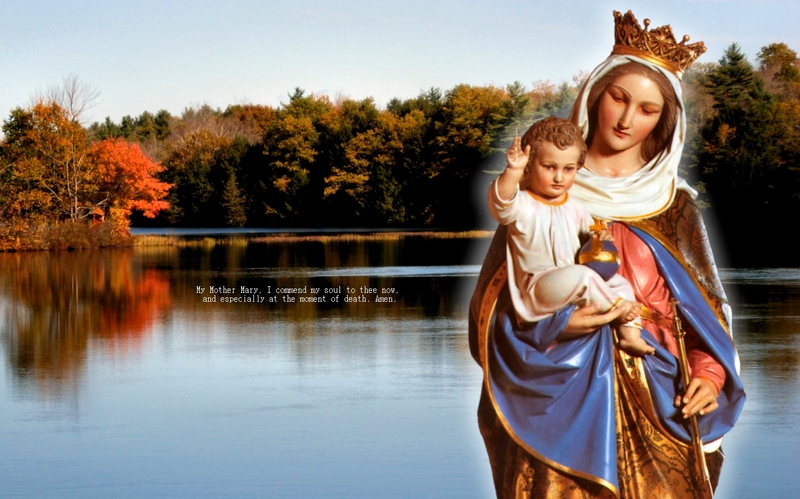 Mother of Mercy, I name thee Lady and Queen of my family and relatives, my interests and all my undertakings. Take charge of them; dispose of everything as it pleases thee. Bless me and all my family. Never let any of us offend thy Son. In every temptation defend us; protect us in every danger; provide for us in the necessities of life; counsel us in doubt; comfort us in every sorrow, in every sickness, and especially in the final sorrow of death. Never let the powers of Hell boast that they have enslaved any of those who here consecrate themselves to thee. Grant that we may all enter into Heaven to thank thee and, in thy company, to praise and love Jesus our Redeemer for all eternity. Amen. Thus, may it be. QUEEN of Heaven, most Holy Mary, I was once a slave of sin, but now I consecrate myself to thee as thy client forever. I give myself to thine honor and service for the rest of my life. Do not reject me as I deserve, but accept me as thy servant. I have placed all my hope in thee as my Mother. I bless and thank Almighty God, because in His mercy He has given me this confidence in thee. It is true that in the past I have shamefully fallen into sin; but I trust that, through thy prayers and the merits of Jesus Christ, I have been forgiven. But yet, my Mother, this is not enough. One fear I have which troubles me: that I may fall into sin again and lose the grace of God. The dangers are constant; my enemies never sleep; and new temptations will assail me. O my Lady, protect me. Help me in the assaults of Hell, so I may never again offend thy Divine Son Jesus. Let not the same thing happen again, that I lose my soul, Heaven, and God. This is the grace I beg of thee, O Mary; this is what I long for; obtain this grace for me through thy prayers. Amen. Thus, I hope. Thus, may it be. O MARY, of all creatures thou art the noblest, the purest, the holiest, the most sublime, the most beautiful. Oh, that all knew you, my Lady, and loved thee as thou deserveth! I too, though I am a sinner, love thee, my most amiable Queen. And yet I love thee too little. I long to love thee with a greater and more tender affection, and it is thou who must obtain this grace for me. To love thee is a singular mark of predestination, a grace that God grants to those who are saved. Then too, my Mother, I realize my great obligation to love thy Son; I see that He deserves an infinite love. Since thou desireth so much to see Him loved, obtain this grace for me --- a deep love for Jesus Christ. I have no wish for earthly goods, for honors, for riches. I ask for that which thine heart desires far more, to love my God alone. Is it likely that thou wilt not help me in my desire, which is so pleasing to thee? Ah no, for even now thou art praying for me. But I am consoled in thinking that so many Souls in Heaven and saintly people on earth love thee for thy goodness and beauty. Above all, I rejoice that God Himself loves thee alone, more than He loves all men and Angels together. Pray for me, Mary; pray and never cease to pray until thou dost greet me in Heaven. There I shall possess my God forever . There too I shall possess my dearest Mother. Amen. Most Holy Mary, Mother all-good and all-loving, when I remember my sins and think of the moment of death, I tremble and scarcely know where to turn. But my hope is in the Blood of Jesus Christ and thy powerful intercession, O my loving Mother. Comforter of the afflicted, be with me in that hour, console me in that great affliction. If even now the remorse over my sins, the uncertainty of pardon, the danger of relapse, and the rigor of Divine Justice so frighten me, how will it be with me then? Ah my Lady, obtain for me before death comes a deep sorrow for my sins, true amendment, and fidelity to God for the remainder of my days. And when at last the hour of death arrives, O Mary my hope, help me in that terrible anguish in which I will find myself. Strengthen me against despair over the remembrance of my sins, which the devil will call up before me. Obtain for me the grace to call upon thee over and over in that dread hour, so that I may die with thy name and the name of thy most holy Son on my lips.Thou hast granted this grace to so many of thy clients. I too desire it and hope for it. Amen.